Increase your shaper's versatility with our rub collars!If you do any kind of irregular shaping, these rub collars are a must! Rub collars are used for shaping curved work such as cathedral doors as well as many custom shapes. They are also used for limiting the depth of cut (same principal as router bits with guide bearings). 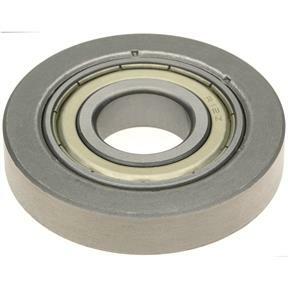 Use them below, in between, or above cutters.Our rub collars feature high-quality shielded ball bearings. Increase your shaper's versatility with our rub collars! If you do any kind of irregular shaping, these rub collars are a must! Rub collars are used for shaping curved work such as cathedral doors as well as many custom shapes. They are also used for limiting the depth of cut (same principal as router bits with guide bearings). Use them below, in between, or above cutters. Our rub collars feature high-quality shielded ball bearings.